“You all recovered from the weekend?” he asked from behind the tall counter. I faltered and wondered internally. Recovered? Was I sick? Was he confusing me for someone else? I looked at him bewildered as he selected the best piece of halibut to butcher for me. My puzzled face must have said it all. “The game? All the football?” he followed up, motioning football passes with the raw fish. My butcher looked at me as if I had three eyes. Yes, it’s true, I may be the only person in the Bay Area who had absolutely zero interest in watching the 49’rs play their critical game last Sunday, and while many may not understand, football is just something I can not sit through. I’ve tried. But the start-stop-start-stop rhythm irritates me, the pace I find extremely vexing. Just run across the field already! I’d rather bake some scones. So come Superbowl, I’ll be keen on the commercials, but as for the game itself, well, while it would have been nice if San Francisco could have made it, I probably wouldn’t have even watched it then. But for all you football fans, I’m excited for you, I really am. I know it’s a big deal. I have something that is worthy of parking it in front of the television for couple of hours, whether it’s a big game, the Winter Olympics (now that I am really excited for! ), or a good movie: Spicy Sriracha Popcorn. Buttery and fiery, this is my new favorite way to gobble up stove popped popcorn. I’m sharing it on Wayfair.com today. I warn you, though, it’s addicting. 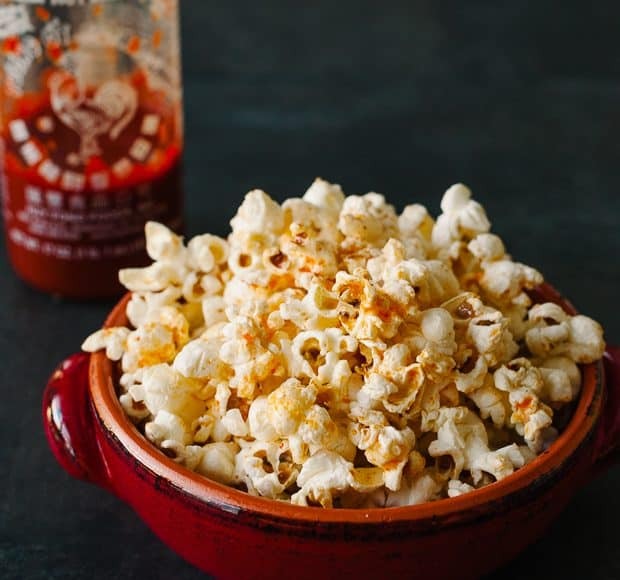 Please join me and find the recipe for Spicy Sriracha Popcorn on Wayfair.com. HA! this post made me laugh. . I grew up in Texas, where as soon as you’re born, they put a football into your tiny little hands and teach you how to throw it. :) kidding .. but not really. :) I totally love watching football and basketball. . but what makes it fun for me is having good game day eats, beverages and friends around. makes all the difference! 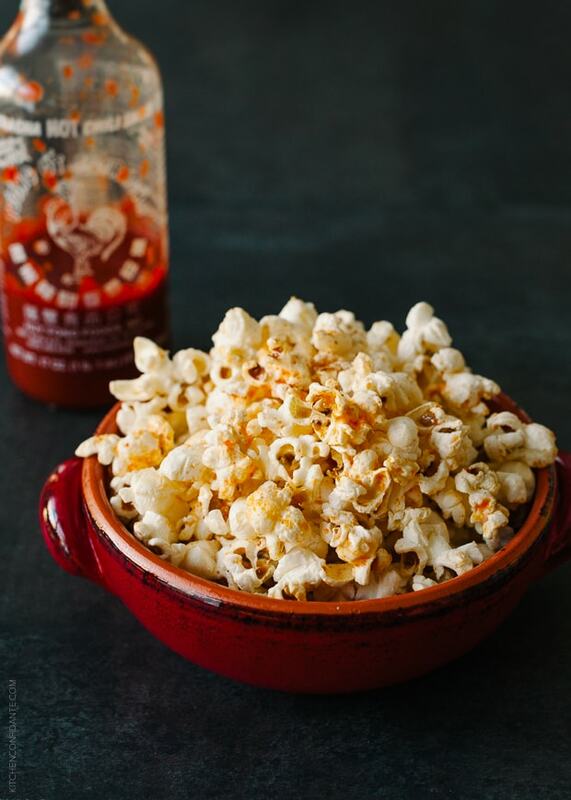 love this sriracha popcorn! got the recipe from wayfair.com. Oh yes, Texas! They are, indeed, serious about football there, aren’t they? My inlaws live down there, and I’ll never forget when I saw the signs on the lawn advertising high school football players and cheerleaders when they made the teams! Well, I agree with you that the fun of it is the game day eats — for that you can always count on me! I also was laughing!! I am Polish and football has never been my things. For that matter I am not into watching sports. I should be very carefully with this statement, especially here in US:) but I am a hug fan of popcorn. Typically with cinnamon and sugar but spicy also seems divine especially in the snowy weather. I will give a try soon!!! Ah cinnamon sugar popcorn, I love that, too! I’m so glad you can relate, Joanna! For me to watch a sport, it must be fairly fast paced (tennis, swimming, skiing) or artistic (figure skating, gymnastics)! I cannot wait to try this. I bet it’s as delicious and it sounds. I hope you like it, Dee! I do not watch football either, yuck! But this popcorn sounds amazing, my fiance would love this. I hope your fiancé (and you!) like the popcorn. So glad I’m not the only one who doesn’t like football! This popcorn… can’t wait to try. Will happen this weekend probably. Love Sriracha. Oh good! You understand :) Well, hope the boyfriend approves!! Love your spiced up popcorn, this would be a perfect pre-dinner snack. I’m with you, I’d much rather bake scones too :). You know I’m the same way… though, I am fine with having a game on in the background while I do work. Something to tune in to when things get exciting. But, I agree, it takes WAY too long to get through a game. Heading over now to check out this popcorn! Love that you added spice to it! True, it is nice having background noise while working…I can’t wait for figure skating and downhill skiing and the Olympics, just for that :) Sometimes I think football was created for the ridiculous amount of commercials rather than the other way around! Totally agree, Dixya. I love game day foods! Thank goodness for that! So innovative Liren. I love the flavors in this popcorn, So unexpected! Now that’s a popcorn flavor I could go for, I might have to make it for the Superbowl! Thanks for the great idea! I’ll be making spicy sriracha popcorn as one of my Super Bowl snacks. We always get together for the game. Go Seahawks! دکوراسیون داخلی و دکوراسیون در مجله دکوراسیون اتاق را با ما ببینید. Love those additions — I will try that next time! !